Hutchinson Island Florida | Information Guide for Hutchinson Island Florida and Classified Directory for Jensen Beach, Stuart, Fort Pierce, Florida. and Vero Beach FL, Martin County, St Lucie County, West Palm Beach Stuart Florida businesses. 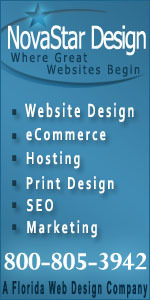 NovaStar Design - A website design and development company located in Jensen Beach, Fl. serving nationwide and local area businesses including Port St Lucie, Stuart, Fort Pierce, West Palm Beach, Vero Beach, Jupiter, Hobe Sound, Martin County, St Lucie County, Palm City, the Treasure Coast and all of south Florida. Authentic sea glass jewelry made from sea glass found right here on Hutchinson Island, Florida. Sea glass or sometimes called beach glass is made from manmade glass that ends up in our oceans. From there, Mother Nature takes over to adding her special touch, tumbling the glass naturally in the sand creating a beautiful piece of frosted glass. Sea glass can be found in many different colors here on Hutchinson Island and we've found a jewelry designer that creates sea glass into beautiful pendants, necklaces, earrings, and bracelets. Visit: www.seaglassjewelrybysam.com where you can purchase sea glass jewelry. You can also contact the sea glass jewelry designer for wholesale or bulk pricing if you're interested in adding these beautiful pieces to your store or boutique to offer to you customers. What a great souvenir to take home or have send directly to that special someone! Hutchinson Island Homes for Sale : Treasure Coast Real Estate agents specializing in ocean view condos, oceanfront homes, and riverfront and waterfront property. Indian River Lagoon and Swampland Boat Tours - conducts guided, educational and entertaining scenic boat tours of the Florida Indian River Lagoon (IRL) and Estuary. Tours are conducted seasonal from the Fort Pierce FL City Marina aboard the 44 passenger pontoon boat, "Gator". Perfect for large groups! Contact Swampland Boat Tours for your chance to see Florida's wildlife at it's best including dolphins, manatee, various birds and more! Lake Okeechobee boat tours also available for your chance to see Florida's alligators, birds and other wildlife. Remote PC Fixer's - Live, remote Computer PC and Laptop Tune-Up services. ACE Window Tinters - Specializing in Commercial, Residential and Auto Tinting located in Port St Lucie, serving Port Saint Lucie, Fort Pierce, Jupiter, Stuart and all of Martin County and St Lucie County. Contact ACE Window Tinters for a free estimate on window tinting.